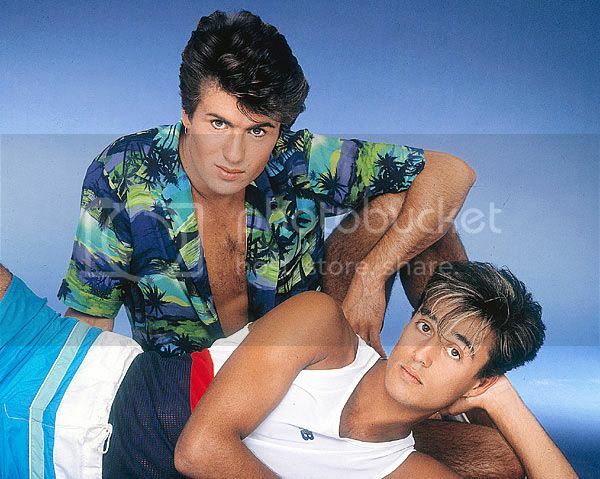 George Michael And Andrew Ridgeley Remind Us to "Give A Wham!" In The Ridiculous "Wham Rap!" The publisher of this site and I have often fallen out over our differing tastes in music. He is an Encyclopedia Nerdicus on the matter, frequently quoting obscure lyrics in casual conversation and espousing new musical talent almost before the artist in question has left the maternal womb. I ceased updating my music knowledge before the turn of the last century. I know what I like and what I like most is from the '80s and '90s. I'm still enjoying that music, so I feel no need to go acquaint myself with the Lady Gagas and Justin Biebers of the modern world (although if either of them collaborated on a duet with Boy George...). Despite this, perhaps in a typical moment of drunken misjudgment, the editor not only agreed to, but encouraged me, to write something for the site about any song I wanted. And after a moment of prayer to my personal god, Neil Tennant of the Pet Shop Boys, inspiration hit. A song so fantastically representative of the early '80s, so laden with my childhood memories and so aurally torturous to my publisher-nemesis, that it couldn't fail. Enter: "Wham Rap!" The year is 1982, the place is Britain. Two teenage lads pair up to form a duo called Wham, release "Wham Rap!" and sell none-dreds of records. But their next song charts and so the following year "Wham Rap!" is re-released and becomes a hit. It is, as the title so subtly implies, a rap song. And kudos of some sort must be handed to George Michael for spotting a trend that was, at that time, largely still an underground, American one. But probably the kudos should stop there. George rapping is sort of like a cat swimming - even though it can, doesn't mean it should. Still, this somehow adds to the awesomeness of it all. The song was accompanied by a video that very much needs to be seen - it's '80s kitsch at its finest and there's a lot to revel in. It starts with George preening in a mirror, then strutting down a city street, sporting a leather jacket and fluffy hair. If Saturday Night Fever had taken place in a London suburb, and been directed by Alan Parker, this is what the opening scene might have looked like. He's rapping about having 'street credibility' - if that street is Sesame, then he's possibly correct. He's on his way to see his mate Andrew Ridgeley, who is sitting miserable at his parents' house with a white sweater draped jauntily over his shoulders. His parents want him to get a job, but then George arrives and sorts that little mess out, telling him he needs to 'get some space'. Cut to George and Andrew on a stage dressed in matching leather jackets and peddle-pusher jeans, exhibiting some dad-dancing that is truly tragic in ones so young. The song continues on, extolling the virtues of being 'on the dole', the fun of pubbing and clubbing off the proceeds of an unemployment check and generally advising listeners to 'give a wham, give a bam, but don't give a damn'. As if we needed to be told. It's all good, cheesy, harmless fun in the form of a catchy song and bathed in the warm light of teenage nostalgia it becomes even more amusing. But what if I tried to convince you it was also slightly subversive? In January 1982, unemployment in Britain had hit 3 million people - the highest since the 1930s. One in eight of the adult population was out of work and young people were hit particularly hard, resulting in riots in some parts of the country. Margaret Thatcher's government wasn't doing a particularly convincing job of offering hope to anyone, and her opponents were shouting about 'the right to work'. Things were grim. In the midst of all this turmoil come a couple of young lads, giving society the two-fingered British salute and encouraging their peers to stop worrying, take that benefits check and enjoy. OK, so maybe it's not up there with Dylan's "The Times They Are A-Changing," but for a couple of nineteen year old popstars, that's pretty political. Can you imagine Demi Lovato singing about Obamacare? Wham revived "Wham Rap!" on their final album, changing the lyrics somewhat, but retaining the message that it's better to party your life away than work for a living. Given that they were multimillionaires at the time, it loses something in the impact. But I remain a vocal supporter of the original, which encompasses the '80s pop I love so much while reminding me how important it is to always 'give a wham'.